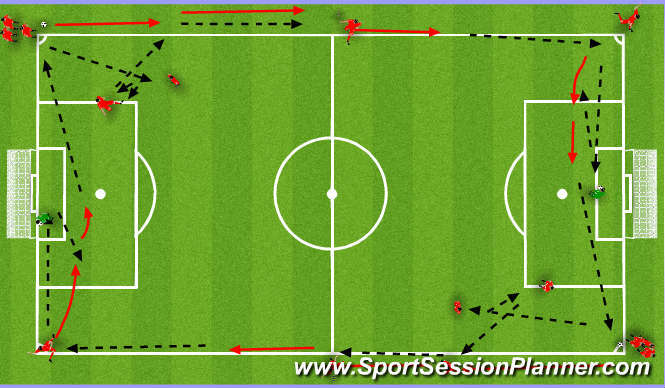 Session Objective:Warm up drill focussing on developing long ground passing and quality of running with ball. Players arranged as set.Two balls,starting in opposite corners.Player plays in to midfielder who sets to other midfielder who plays ball in front of first player who has continued his run after playing ball.He then plays to next player on half-way line (taking his place) who takes ball on half turn and runs with ball then plays to next player in corner (then taking his place).This player drives ball low into keeper who takes and feeds back to same player who has continued his run.He receives then plays to next player in corner (and then joins back of group in corner) and cycle starts again.Both sides start at same time. Development:a)Two midfielders change place quickly after playing ball each time. Touch;ball out of feet.Running with ball under control/appropriate distance.Quality of pass.Touch to receive back foot. Three teams,each in own area.Greens play long ball to Red.Red have to take at least three touches before trying to play back to Green either over or through Blues.As soon as first Red player plays ball one nearest Blue player can close down.If Blue team manage to dispossess or intercept pass ,team losing possession becomes team in middle. Developments:a)vary number of players who close down from 1 to 2 or 3.
b)vary number of passes needed before ball can be played long. c)Advanced:When one Blue Player closes Red down,at same time one Blue player goes into Green area.When ball played to Greens,movement of ball in possession will now have to be quicker.Another Blue player from middle area will also close down. 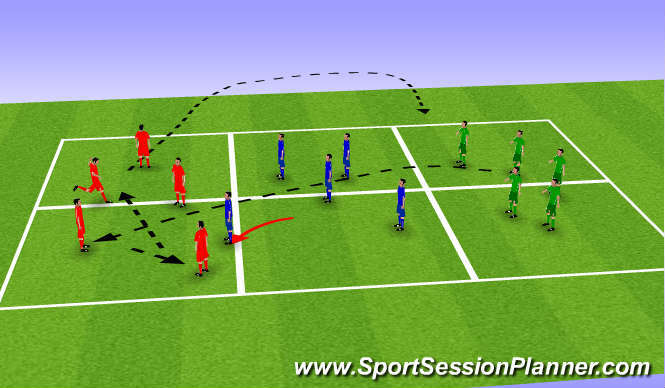 Position to receiveand first touch.Adjustment when ball in air to receive second pass.Knowing where space is to maintain possession.Quality of passing.Angles and movement to receive.Quality of long pass. 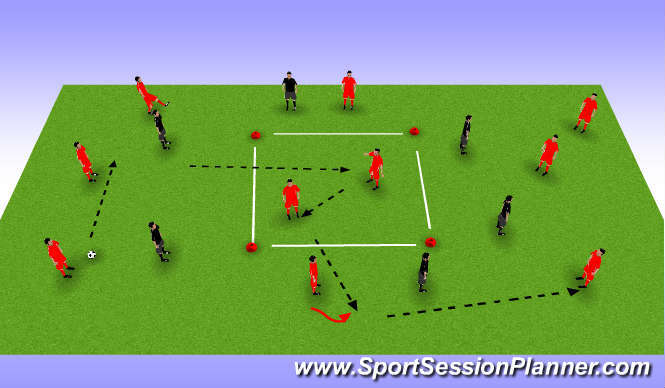 Session Objective: To improve possession through movement before and after receiving ball. Overload red team with two players unopposed in box in centre of pitch.Reds keep possession and can also play ball to mplayers inside box.They have one touch each and ball is returned to outside.Can develop by player who plays ball into box takes place of player who plays ball out of box. Know where space is to take ball. Create space to receive(movement before). Quality of pass (and movement after).